The villa was great. The plunge pool was a great distraction for the kids. The main pool was good. Breakfast was small in options but plentiful and well cooked. The staff were very friendly and informative. The hotel owners also run a restaurant complex called "buffalo steak house" which is about a 5 minute taxi away. Fantastic food in the main restaurant and equally good in the thai restaurant behind on the same complex. The hotel owner even arranged for a free taxi back twice. Very good service. 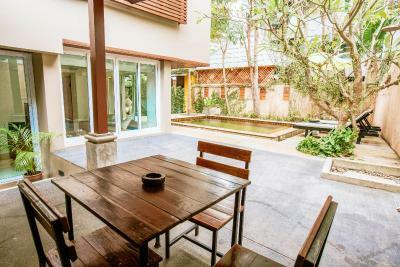 The location is nicely tucked away to the back of Chaweng strip so peaceful enough yet close enough to walk down to. The room was so awesome, loved it!! So modern! The breakfast was good and I asked them to make me a vegetarian breakfast each morning and it was different each time :) the pool was our favourite bit, perfect temperature to cool down. All the food was good and couldn't be made vegetarian. Breakfast was good but just 4 different ways to have eggs, the rest was the same, but good, and quick. 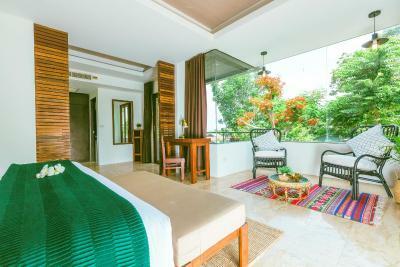 Room was great, good TV channels, fantastic view, well furnished, kettle etc. and a great view from the shower which was surrounded by glass (blinds if you wanted them :-) ) Pool was cool as it was in the shade from wonderful trees most of the day, but that was lovely when it got hot in the afternoon. Bar/breakfast/lunch staff were great and very friendly. Rented as scooter from them, reasonably new Honda which did lots of K's with me, petrol stations nearby. Laundry also available at the bottom of the road which I used twice and very happy with service. It's also a great location. Only a few minutes on the scooter and you're in the middle of Chaweng with choices of food everywhere and a 7-11 or Family Mart on every corner. Make sure you catch the community food market on Saturday nights! I really enjoyed my stay. 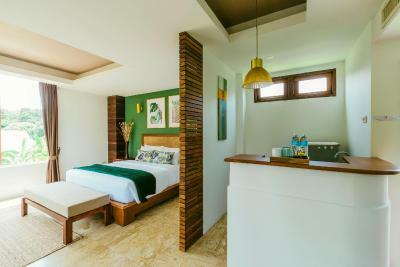 Had one of the most Comfortable Beds i slept in while i was in Thailand. The room was very big so you could easily spread out your luggage and not have to step over it. Large Fridge which would be perfect if you were staying for a week not cramming food and drinks into a tiny fridge. 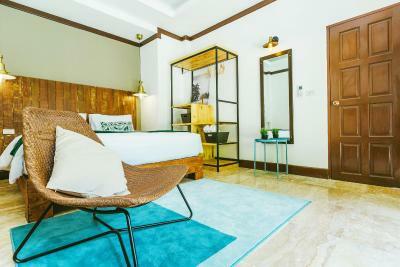 The room was very comfortable and spacious. The bed was really nice and big and made for a very decent sleep. The swimming pool was lovely and refreshing. The breakfast was also good, although limited in selection. The staff was very friendly and always willing to assist in arranging a scooter and transfer to the ferry pier. 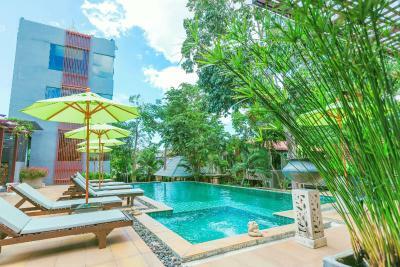 The hotel is also tucked away in a small alley so it is not noisy at all, which is great for Chaweng. good location just outside of the centre. 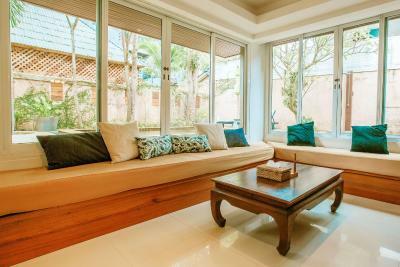 10minute walk to central festival or short taxi ride to other areas. Would recommend getting a moped to explore though! Good shop right by the hotel. 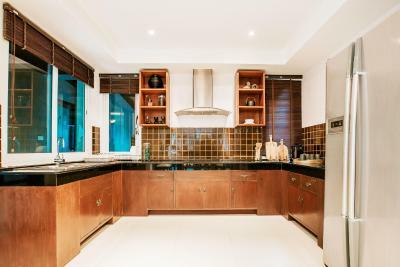 Nice large, clean room but the kitchenette did not serve any purpose as not provided with any cooking equipment and was in need of some TLC so just let the room down. Nice breakfast and really friendly and helpful staff! 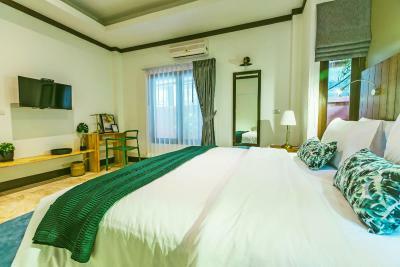 Situated on a hill slope in the northern part of Chaweng Beach, Baan Khao Hua Jook is a small boutique accommodation in the downtown of Koh Samui. 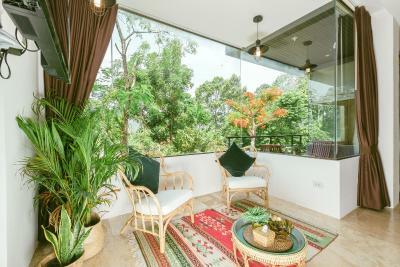 Boasting stylish interior with emerald green accents, guests can enjoy spectacular views of Chaweng Lake and tropical gardens or make use of various facilities including a swimming pool, a gym and a restaurant. 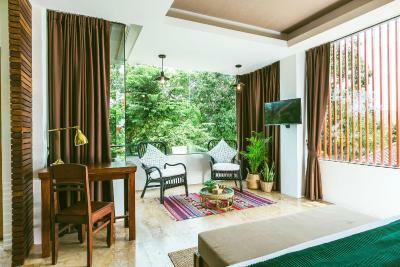 Set within tropical greenery, the air-conditioned rooms come with a seating area, cable TV, and a fridge. 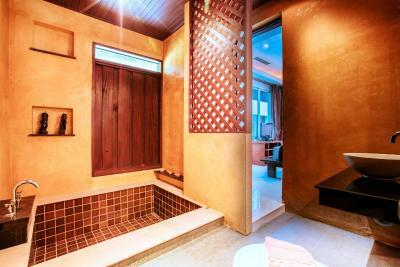 Each room has a private bathroom with a bathtub and shower. 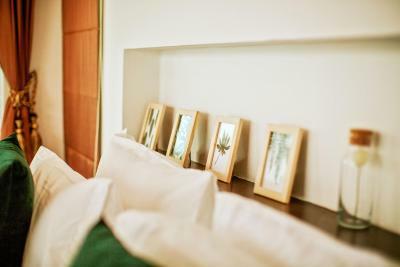 Guests can enjoy a relaxing massage, or rent a DVD player and DVDs. Tour bookings, ticketing services, and airport transfers can be arranged at the travel desk. 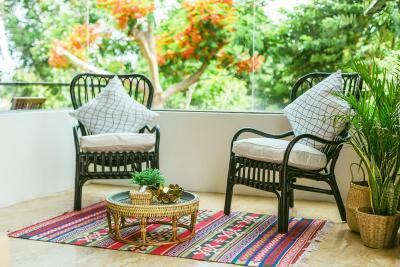 Car or motorbike rentals, laundry, and fax services are also provided. The poolside restaurant serves Thai, Western and seafood dishes. 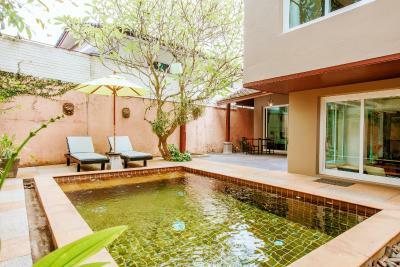 Offering easy access to Samui's main attractions, Central Festival Samui Shopping Centre is just a 5-minute walk from the property, while Chaweng Public Beach is only a 5-minute motorbike ride away. 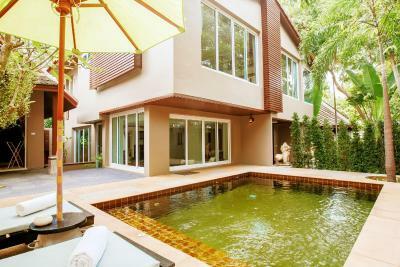 The nearest airport is Samui International Airport, 1.9 miles away from Baan Khao Hua Jook. 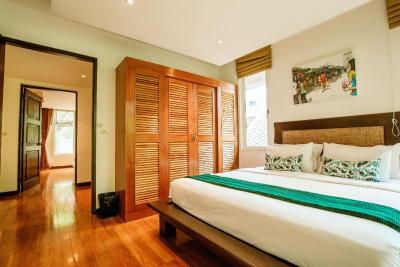 Baan Khao Hua Jook has been welcoming Booking.com guests since 21 Sept 2011. 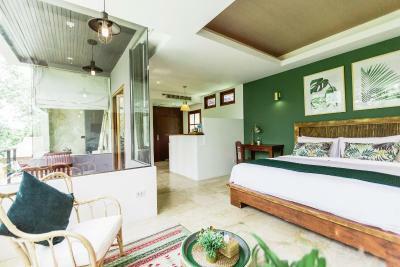 When would you like to stay at Baan Khao Hua Jook? 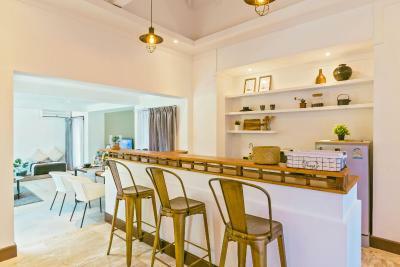 Located on the first and second floors, this standard room with balcony features a living corner and a counter bar where guests can relax and enjoy their favourite drinks. 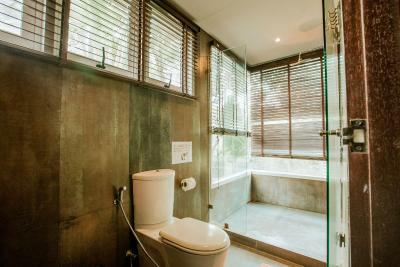 The en suite bathroom is equipped with a bathtub and shower facilities. 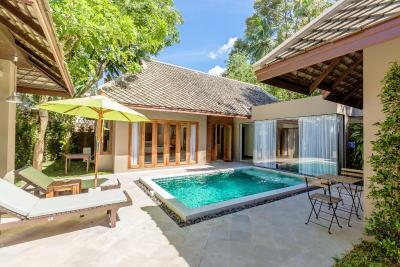 Boasting a private pool and a garden, this stylish tropical-style villa features 2 bedrooms, 1 bathroom and 1 dining room with a pantry. 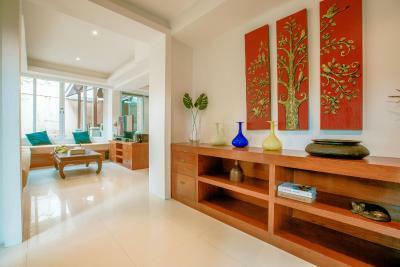 Featuring a private pool, this villa boasts 4 bedrooms, 4 bathrooms, a kitchen, a living room and a dining room. 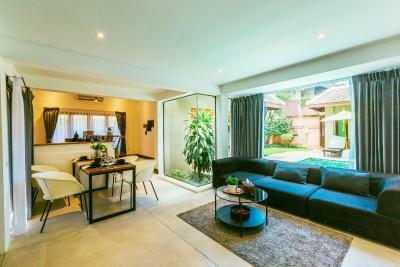 Offering a private pool and a garden, this deluxe villa features 3 bedrooms, 2 bathrooms, a living room and a dining room. 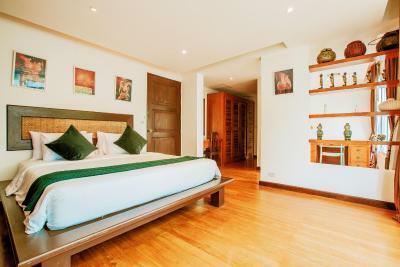 Situated on the third floor, this suite offers stunning view of Chaweng Lake and all necessary amenities. 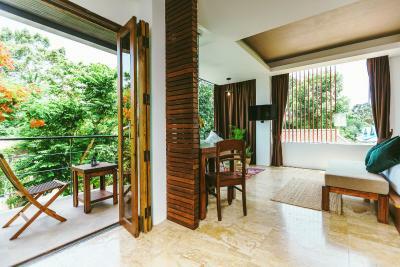 This corner room comes with living area and counter bar where guests can relax and enjoy their favourite drinks. 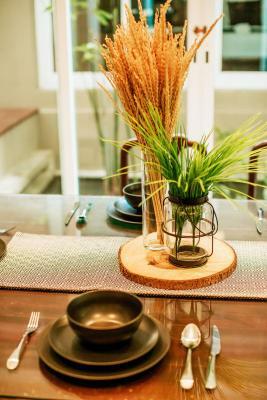 House rules Baan Khao Hua Jook takes special requests - add in the next step! 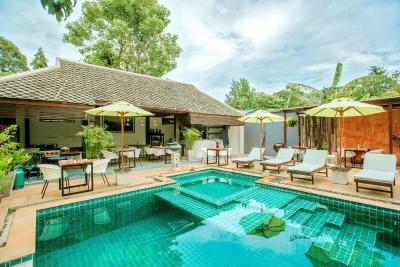 Baan Khao Hua Jook accepts these cards and reserves the right to temporarily hold an amount prior to arrival. Unfortunately the wifi would drop out on regular basis. 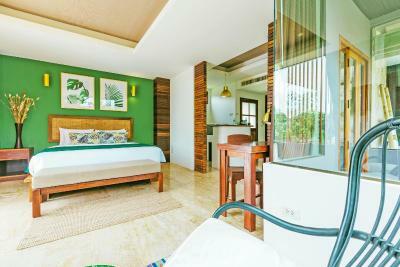 Although that may well be the supplier rather than the resort. The air con in one of the bedrooms didn't really get down to a great temperature but did work. The TV couldn't mirror our phones. We couldn't leave the air-con on without the key in the slot so when we were out the room got very hot. No lights at the pool at night. The freezer door inside the fridge was missing and so anything in the fridge, like water or milk, would freeze. At least it was cold! 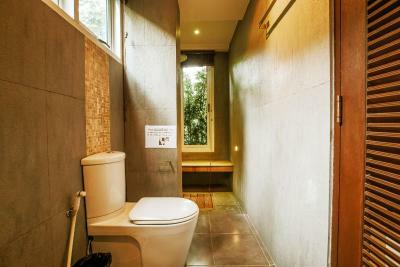 Bathroom so so. 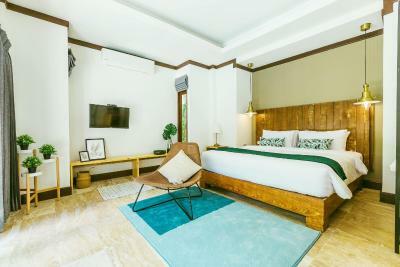 The air conditioning blows straight on the bed and there was no way to adjust the strength of the air with the remote control, i got my neck stuck on the second day... had to find a remedy placing towels in from of the air outlet to avoid the direct blow. Position, good value for money, staff. 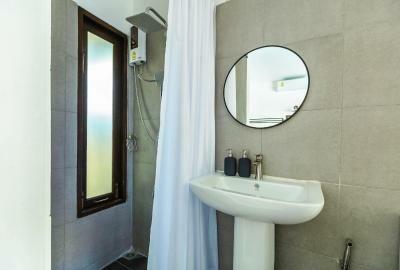 The balcony doors and the tiles in the bathroom had gaps which resulted in insects in our room all the time! The floor was crawling with ants that got all over our clothes in suitcases (we didn’t have any food in the room!) + there was a massive cockroach in the bathroom!! I was seriously afraid to sleep! 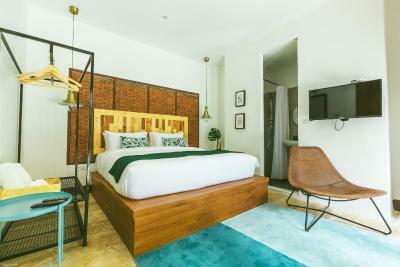 Everything else was really good and everything looks amazing and luxurious but this was such a drawback for me, I was really glad we only stayed one night! Also the location is a bit remote to get to the beach, it took us around 20min. There’s a motorbike rental at the hotel iIthink but if you’re not s skilled driver I would think twice before renting a scooter on samui! 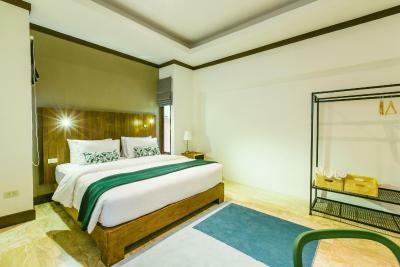 The room was nice and bed reaaallyy comfortable. Nice big bathtub. Amazing pool and good breakfast. The staff was really nice, they wven printed out our transfer tickets for the next day and gave us 2 free bottles of water because we forgot to buy it. The english of some staff members are really bad! The hotel is really good located. Not in the middle fo the crowded area but by walking you reach it in 10 minutes and 15 minutes to the beach. 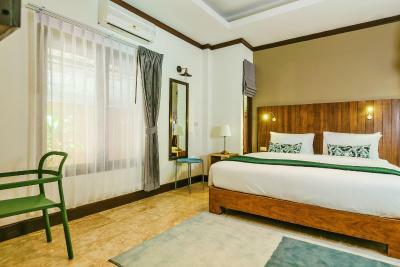 The staff is friendly and the rooms and Villas are really nice and clean! 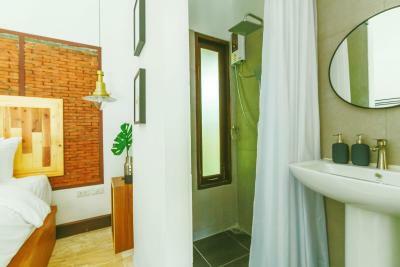 Even though the bathroom looks lovely, on closer inspection it needs a lot of attention. 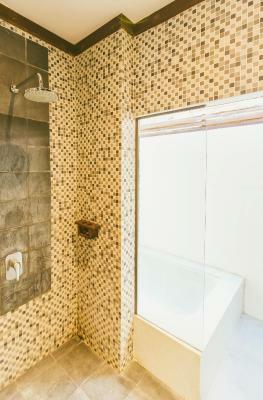 The bathtub needs a good scrub as there is quite a lot of residue, which is not inviting and feels dirty. Also there is a very strong drain/sewrage smell in the bathroom. I suspect this is due to our room being on the bottom floor and all pipes from above units flow through this one. However, this needs to be looked into. Also, the lower floors have no view of the lake, only of the opposite houses. The coffee served with breakfast was not that great. Just the dysfunctional kitchen space. Everything else was great! The Bathroom is very dirty and old.. 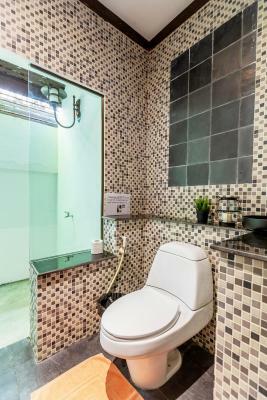 The sink has molds as well as the bathtub. The curtain has a bad smell.